If you take away all the talking parts, the Country Music Hall of Fame Medallion Ceremony on Sunday evening (Oct. 27) was a whale of a concert. The two-hour-plus event boiled down to a delicious banquet of musical performances. I knew we were in good hands when Connie Smith kicked things off by totally rocking the Hank Williams jewel “Sing, Sing, Sing.” This annual event traditionally begins with a gospel performance, and hers was as good as it gets. The song appears on her album Connie Smith Sings Hank Williams Gospel. If you don’t own it, you’re a fool. 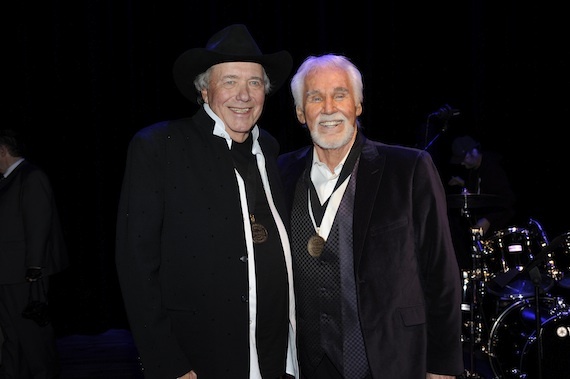 Bobby Bare and Kenny Rogers. Photo by Donn Jones. 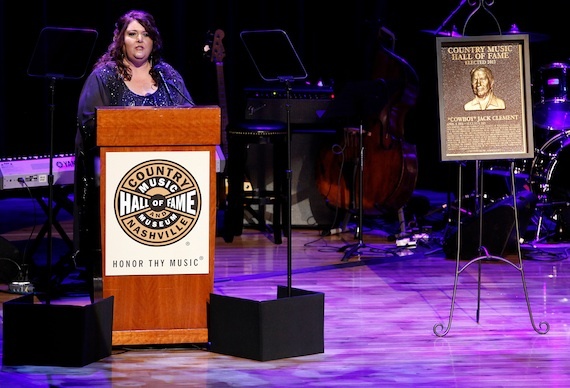 The ceremony honored this year’s Hall of Fame inductees, Jack Clement, Bobby Bare and Kenny Rogers. “Cowboy” Jack Clement was saluted in song by John Prine with a charming folk rendition of “Ballad of a Teenage Queen.” Then the Clement-penned hit “I Know One” was given a sublime arrangement by Marty Stuart & His Fabulous Superlatives. That performance was simply jaw-dropping. The Bobby Bare tribute segment began with Rodney Crowell’s yearning treatment of “Detroit City.” Buddy Miller was stunning, soulful and searing on the Bare hit “How I Got to Memphis.” Kristofferson returned to the stage to deliver a wonderfully rough-hewn version of “Come Sundown.” John Anderson climaxed the Bare musical segment with a terrifically wry take on the delightful “Marie Laveau.” That song was written by Shel Silverstein. If you don’t own Bare’s Silverstein-concept album Lullabies, Legends and Lies, you are also a fool. Darius Rucker was the first to sing for Kenny Rogers. He did a strong and steady “Lucille” that brought the song’s ultimately tragic message back to the forefront. Songwriter Don Schlitz did “The Gambler” with verve and sincerity. Barry Gibb & Kelly Lang performed an affectionate, buoyant “Islands in the Stream,” and Alison Krauss was rose-petal lovely on “Sweet Music Man” to close out the Kenny segment. That lady embodies musical class. Throughout the show, The Medallion All-Star Band backed everyone to perfection. Led by awesome keyboardist John Hobbs, this group included Eddie Bayers (drums), Deanie Richardson (fiddle, mandolin), Michael Rhodes (bass), Biff Watson (acoustic guitar), Thom Flora (vocals), Tania Hancheroff (vocals), Michael Johnson (steel guitar) and J.T. Corenflos (electric guitar). This was Johnson’s first gig with the band, and I am told that he became teary-eyed about playing these truly classic country songs. Hooray for that, because I feel exactly the same way listening to them. The band did a dandy number on its own, a jazzy instrumental take on “You Are My Sunshine.” Then it closed the gig with “Will the Circle Be Unbroken” backing all of the performers, plus the attending Country Music Hall of Fame members. This is also a traditional element of the Medallion ceremonies. By the way, all the singing stars get just one, pre-show run-through with the band. You know what? That’s all they need. OK, now for the non-performance elements of the ceremony. I still like beginning the show with a historic audio clip from the Hall of Fame’s Bob Pinson collection in its library. On Sunday, it was 1943’s “Pistol Packin’ Mama” by Bing Crosby & The Andrews Sisters. Ya gotta love something so vintage hipster. Opening speaker Steve Turner pointed out, “The 2013 Medallion Ceremony is a doubly special occasion, because this is the first event in our new CMA Theater, made possible by a $10 million gift from the Country Music Association.” The theater seats nearly 800 and includes a main floor, mezzanine seating and shallow, steeply-banked lower and upper balconies. The sound is excellent and so are the sight lines. Mark this down as a major, major new Nashville venue. Alison Clement. Photo by Donn Jones. CMA chief Ed Hardy was next. His remarks about the inductees mainly foreshadowed and repeated the accomplishments that Kyle Young was shortly to speak of. Speaking of Kyle, his remarks on each inductee needed editing. Can we enliven the evening by inserting video segments and/or varying the bio narrators? Not that Kyle didn’t have his moments. “We do have a message from ‘Cowboy,’” he told us. “He says, by all means, ‘Relax.’” He also asked for a moment of silence to honor departed Hall of Famers George Jones, Jim Foglesong and Gordon Stoker. Throughout the evening, he offered easy-going asides about performers and honorees. Both Prine and Stuart recalled how they were drawn into Cowboy’s orbit. Clement died on Aug. 8. Kyle introduced the Hall of Famer’s “Leading Lady,” Aleene Jackson, as well as son Niles Clement and daughter Alison Clement-Bolton. Charley Pride did the Clement induction honors. “I think he’s watching, right now,” said Pride. He added that Clement said to him, “Charley, these songs we’re recording, 50 years from now, they’ll still be playing them.” True enough. “There’s something about Bobby Bare’s voice: I just believe every word he’s singing,” said Buddy Miller. 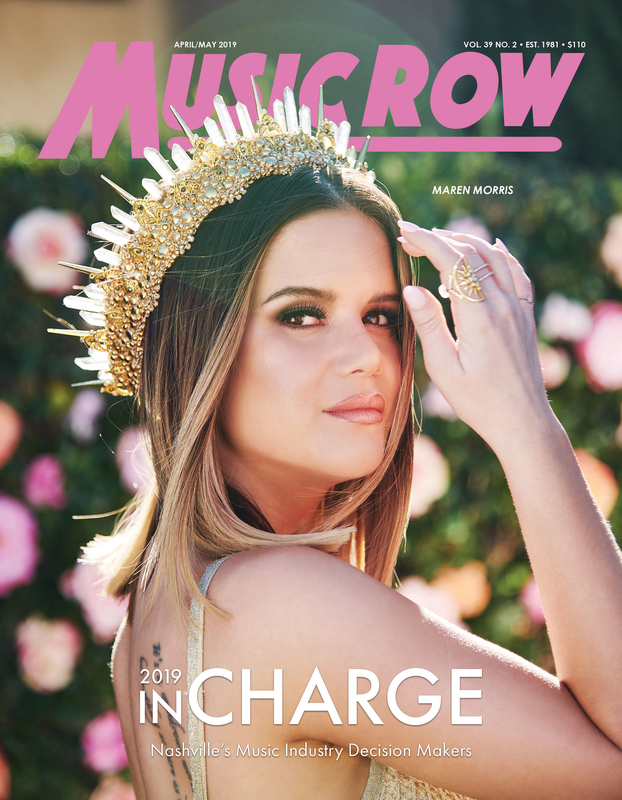 “Bobby Bare is one of the best human beings I’ve ever known,” added Kristofferson. Schlitz praised Kenny Rogers by saying, “You chose to nurture songwriters who came to Nashville with their dreams. On behalf of my fellow songwriters — thank-you, thank-you, thank-you.” Krauss told us how obsessed she is with Rogers, constantly collecting photos of him. 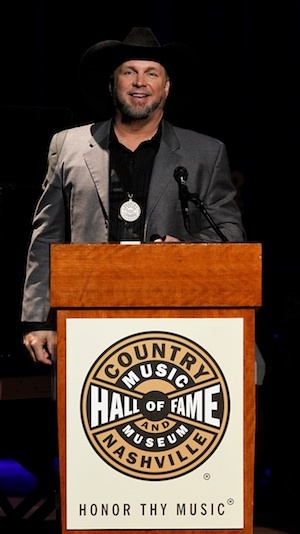 Garth Brooks prepares to induct Kenny Rogers into the Country Music Hall of Fame – photo by Donn Jones. Accompanying Kenny were wife Wanda Rogers and sons Justin, Jordan, Christopher and Kenny Rogers Jr., plus brothers Randy Rogers and Roy Rogers and sister Sandy. After the ceremony, we headed for another major, major new Nashville venue, the sixth-floor Event Hall. It’s actually three major, major new party spaces — the spacious vestibule, the outdoor balcony overlooking the new Omni and Music City Center and the Hall, with its chandeliers, draped tables, lounging furniture and glass wall’s awesome view of the downtown skyline. The cocktail supper featured wilted salad, steamed salmon, seasoned rice dishes, melt-in-your-mouth carved roast beef and assorted dessert bon bons. Even better than the food was the star gazing – Attendees included Brenda Lee, Barbara Mandrell, Jan Howard, Jeff Hanna & Matraca Berg, Mel Tillis, Ralph Emery, Ricky Skaggs & Sharon White, Jimmy Fortune, Sonny James, Charlie McCoy, Charlie Worsham, Charlie Chase, Lorianne Crook and Jordanaires Ray Walker and Curtis Young. Handsome Bill Cody did his usual fabulous job of hosting the red carpet entrances. We schmoozed alongside Roger Cook, Roger Murrah, Dan Rogers, Bobby Braddock, Bob Burwell, Bob DiPiero & Leslie Tomasina, Bill Carter, Bill Denny, John Grady, John Esposito, Dave Pomeroy, David Conrad, David & Susana Ross, Mike Milom, Michael Montana, Ernie Williams, Jody Williams, Sally Williams, Steve Greil, Steve Popovich Jr., Steve & Ree Guyer Buchanan, Al Bunetta and Alanna Young. Kenny Rogers was so cool at the cocktail supper, amiably posing for photos with anybody who wanted one. He knows he’s a walking icon and just accepts it. Also working the room were Harold Bradley, Tony Brown, Victoria Shaw, Troy Tomlinson, Roy Wunsch & Mary Ann McCready, Jo Walker-Meador, Don Light, Ken Levitan, Dwight Wiles & Diana Johnson, Jerry Foster, Janice & Bud Wendell, Nancy Jones, Eddie Stubbs, Layng Scott, Gary Overton, Tim Wipperman and Chris Horsnell.